COLUMBIA - Winter weather is expected to continue this morning until around noon. 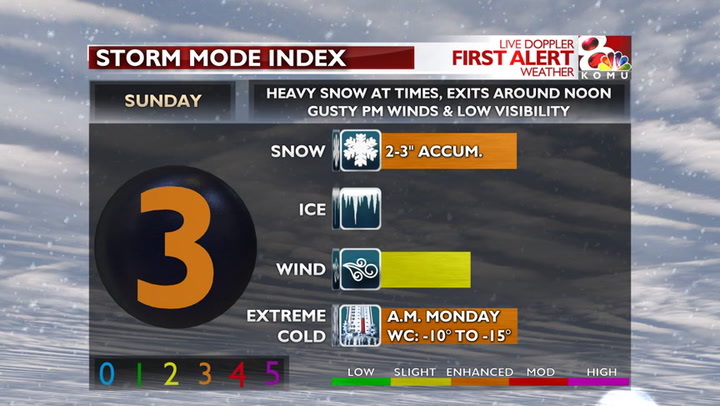 Accumulating snow, gusty winds and bitter cold air will all be factors with this system. Snow showers will continue this morning before tapering off around noon. The afternoon should be snow-free after 2pm. Skies will slowly become Partly to mostly cloudy and some late-day sunshine could be seen. Snow accumulations have been continually been adjusted as this storm has produced slightly lower totals west of the KOMU 8 viewing area. Overall, most in central Missouri will receive around 2-3" accumulation throughout the morning. Areas in western Missouri closer to Sedalia could receive up to 4", but those totals would be very isolated. Most major roads will remailn snow-covered, especially I-70. As mentioned in the accumulation section, several inches of snow is expected and will likely lead to covered main roadways Sunday. Travel is not advised Sunday until late-afternoon. These roads would include: I-70, HWY 63, HWY 24, HWY 54, HWY 50, MO-HWY 5, MO-HWY 17, MO-HWY 52 and MO-HWY 87. Visibility will also be very low during this event, falling to less than 1/4" mile at times. This was a factor in accidents during the last few winter storms and should be taken very seriously, especially during the heaviest snowfall times (through Sunday 12pm). Near record low temperatures are forecast for Sunday night. Lows are expected around zero degrees with some areas as cold as -5 F. Wind chills into Monday morning could also drop as low as -20 F. Monday afternoon temps are forecast to reach the mid teens with wind chills only warming to the single digits. This cold snap will continue through Wednesday.